The first logo was alongside a painting by Mormon artist Simon Dewey entitled "The Lord is my Shepherd." We see this painting a lot. It's very popular here in Kenya. Simon Dewey lives in Cardston, Alberta, which is a 2-hour drive away from where we live in Canada. And another cool name of a matutu company: Trinity Transport. How can you go wrong with that one? I've also been pondering lately how we in "the west" think that our way of doing things is the only correct way and that everyone should live like we do. There are millions of people who live very differently from us and they live very happy lives. The most important thing is to be true to what we know is true: For Christians to live the teachings of Jesus Christ and for Muslims to live the teachings of Mohamed and for Hindus to live according to their beliefs and so on. "Based upon ancient and modern revelation, The Church of Jesus Christ of Latter-day Saints gladly teaches and declares the Christian doctrine that all men and women are brothers and sisters, not only by blood relationship from mortal progenitors, but also as literal spirit children of an Eternal Father. "The great religious leaders of the world such as Mohammed, Confucius, and the Reformers, as well as philosophers including Socrates, Plato, and others, received a portion of God’s light. Moral truths were given to them by God to enlighten whole nations and to bring a higher level of understanding to individuals." "Our message therefore is one of special love and concern for the eternal welfare of all men and women, regardless of religious belief, race, or nationality, knowing that we are truly brothers and sisters because we are sons and daughters of the same Eternal Father." We live next door to a wonderful Hindu family who have become dear friends and on the other side, a Muslim family has recently moved in. 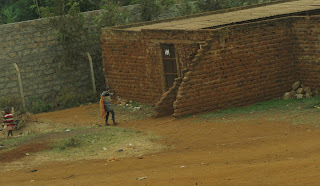 Christian Kenyans live in other flats in our compound. All good people. We are so blessed to know them. On Saturday, LeRon and I drove the 90 kms to Kyambeke Branch in the Kilungu Hills District for some audit work. The 90 kms (about 55 miles) took us 3 1/2 hours to get there and 4 hours to get back. Traffic was very bad! 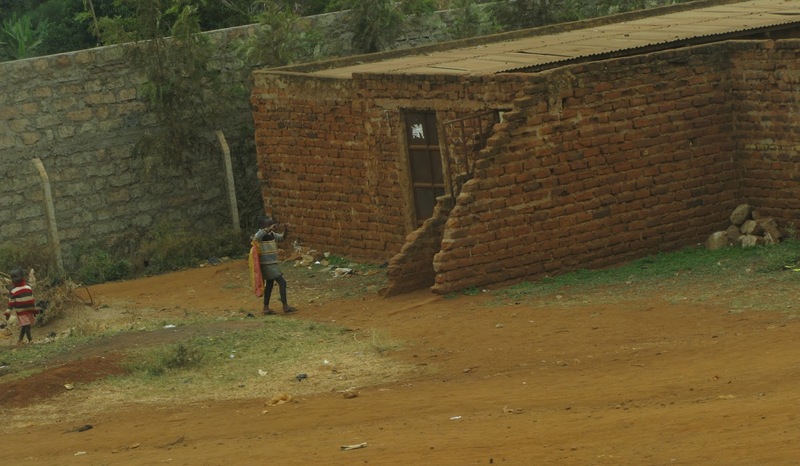 The Kilungu area is gorgeous with its red soil, green foliage, and steep hills. 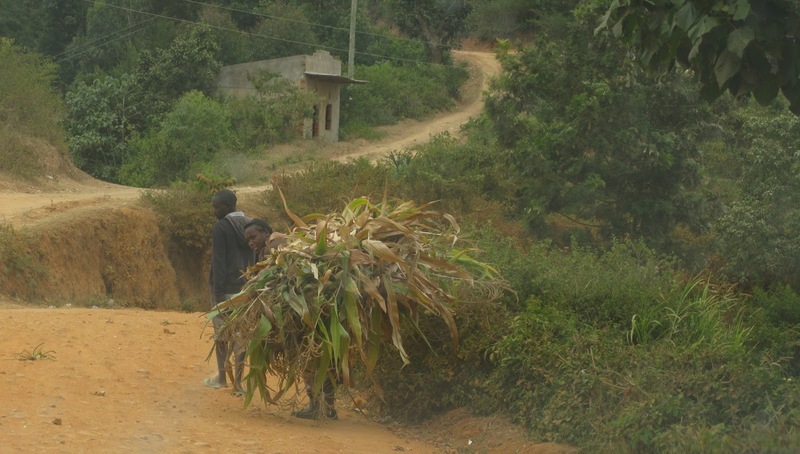 It's no wonder there are no overweight people here: they walk up hills and down each day, often carrying heavy jugs of water on their heads or loads of firewood or cornstalks on their backs. They are strong people! On our way home to Nairobi, as we were just barely in the city, we came upon hundreds and hundreds (possibly more than a thousand) people on the sides of the highway, on the overpasses, and even in the lanes. We were sure it was a political rally. It looked peaceful enough but we knew we needed to get out of there. How do you do it on a divided highway with deep ditches? So we said a prayer and forged ahead. We were the only white faces! Smiling, waving Kenyans pounded on our truck. We know things can turn ugly quickly so we were glad to get out of there!! As the election gets closer we will need to stick closer to home. Today in our sacrament meeting, prayers were offered for peace and safety during the election. Even in Primary (class for ages 3-12), the young people giving prayers begged for safety. We will be safe if we follow our mission president's counsel and do what is right. Enjoy the photos of Kilungu. Unfortunately for you missionary moms and dads, we never met up with any missionaries so there's no pictures of the wonderful young men who serve in that district. Below are a couple of pictures from our day this past week with the Mission Branch Presidents and District Leaders. That is always an enjoyable experience. Such good men. Supper at Carnivore at the Hub. L-R: Mission President Msane, President Kogo of Eldoret District, President Okila of Kisumu Branch, President Imende of Busia Branch, President Itongwa of Mwanza Branch, President Kibanda of Arusha Branch, President Balilemwa, a counselor in the mission presidency, Elder & Sister Torrie standing. The other presidents had already left for home. A fun evening together. We will miss them when our mission is over. I love to catch Sister Msane giving President Msane those loving glances!!! You can tell they are a happy couple who love each other. But I think they would prefer this photo. We are blessed to have been called to serve with the Msanes. It's 8 a.m. and we're on our way to Kilungu. It's a cold, misty morning. In fact, if I were home in Canada, I would think it was going to snow. The sky had that look. And it was 12 C. Very cold for on the equator! This was the beginning of really bad traffic. There was construction along the way and hundreds of semis trying to get through. Police at this intersection were directing traffic. But mainly I took this picture to show all the political posters on the pillars of the new high speed railway line going from Nairobi to Mombasa on the Indian Ocean coast. I really wonder if all these posters change anyone's political viewpoint. And who will take them down? We also noticed posters pasted on the sides of the road and even on the speed bumps. Who can even see the pictures on posters pasted on speed bumps?? This man is digging through the pavement with a pick ax. What a lot of work! We saw about five bad accidents (after they happened, thankfully) along the Mombasa Highway. This tanker truck was ruined I would say and I doubt if the driver made it out alive. I told LeRon that the driver had probably been going too fast. But then LeRon said that possibly a car did something really stupid and the driver had to hit the ditch. You have to be so careful around these big trucks that can't stop as quickly as a car can. Sad to see the accident. We were off the Mombasa highway the last hour of driving. Now it is beautiful red dirt roads. Tried to catch these children out the car window heading to their home. The roads were steep and narrow with foot paths leading out into the forest. We passed many people walking, carrying their burdens, and very few cars. The plants by the side of the road were covered in a fine red dust. This woman was carrying a huge burden on her back. I was ticked at the man walking beside who was not even helping. But maybe they weren't together so I shouldn't get mad at him. Be sure to click to enlarge. The red soil was gorgeous! The day was hazy so it was hard to get a good photo of the beauty of the land. The terraced hillsides grow many crops. No piece of land is wasted. The load on the back of this motorbike is about as big as the load the woman in a previous picture was carrying. Lots of motobikes here but few cars. The haze had lifted a bit by the time we were ready to leave Kilungu but this photo does not do justice to the beauty of the area. Nor do these pictures show how steep the hills really are. Hard to imagine farming here. More dirt covered plants by the side of the road. I wonder how photosynthesis works here. Can the leaves even absorb the sunlight? We passed this woman carrying a load of something on her back. We have a missionary rule that we are not to give anyone except missionaries a ride in our vehicle. (I'm sure it's for our safety). Would have been nice to help this woman. And again, I was ticked at the man walking beside and just watching! !